A good-looking still from a movie isn't necessarily an ideal stand-in for a well-designed poster, but it's a whole lot better than most of the cliched poster designs we see these days, and a welcome sight. 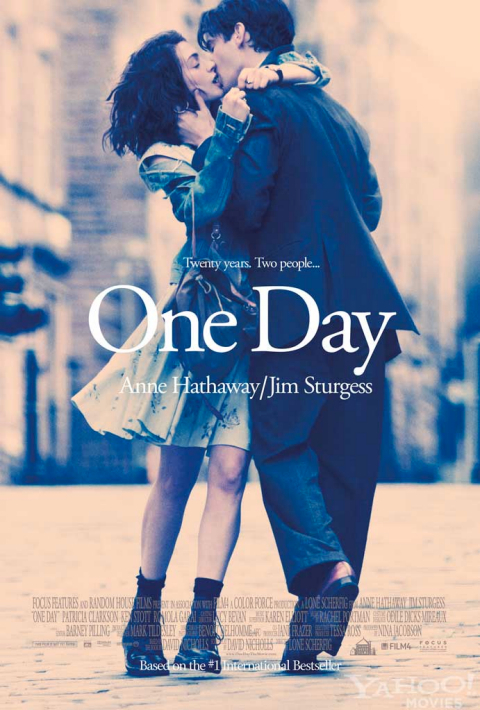 For the poster for One Day, the romance starring Anne Hathaway and Jim Sturgess that's coming out this spring, Focus Features opted to highlight a shot from the film that tells you two important things: these two are hot for each other, and boy they're good-looking. The sepia tone of the image and the tagline "Twenty years. Two people." suggests a nostalgic tone. Really, I like it-- it's unique while featuring an instantly recognizable image and mood. The poster debuted at Yahoo, and you can also check it out below. One Day, based on the novel by David Nicholls, is directed by Lone Scherfig, who last made the lovely An Education. It's set for release on July 8 this summer, a perfect palate cleanser after Transformers: Dark of the Moon and counter-programming against, uh, the Kevin James vehicle Zookeeper. I think you have a pretty clear choice to make that weekend.